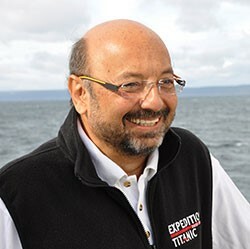 David Gallo is an American oceanographer and explorer. He is currently Senior Advisor for Strategic Initiatives at the Center for Climate and Life of the Earth Institute at Columbia University. Previously he was Director of Special Projects at the Woods Hole Oceanographic Institution. David has been at the forefront of ocean exploration, participating in and being witness to the development of new technologies and scientific discoveries that shape our view of planet earth. He has been described by TED Conferences as “an enthusiastic ambassador between the sea and those of us on dry land.” With more than 12 million views his TED presentation “Underwater Astonishments” has been among the top 10 viewed TED Talks. David is becoming increasingly outspoken about the relationship between humanity and the sea. He feels strongly that instead of taking the oceans for granted we need to recognize the oceans critical role in providing the air we breathe, the water we drink, and the food we eat. David Gallo has lectured internationally to audiences ranging from children to CEO’s. He has given 8 TED and more than 15 TEDx presentations and has appeared in numerous documentaries (Discovery Channel, History Channel, National Geographic). He is currently a CNN Ocean Analyst and is regularly featured on Anderson Cooper 360 and New Day. He has received many awards and recognitions for his work and is a fellow of AAAS and the 2014 Explorer’s club Lowell Thomas medal. He is also a member of the XPrize Deep Ocean Advisory Board and James Cameron’s Deep Ocean Task Force. Convention attendance is not required to attend the banquet. To purchase banquet tickets: ​(1) Register as a professional. (2) Fill out personal information. (3) Register as "Not Attending." (4) Enter the number of banquet tickets. (5) Pay to complete your purchase.